5917 ✉ 5a 8 Pfg. 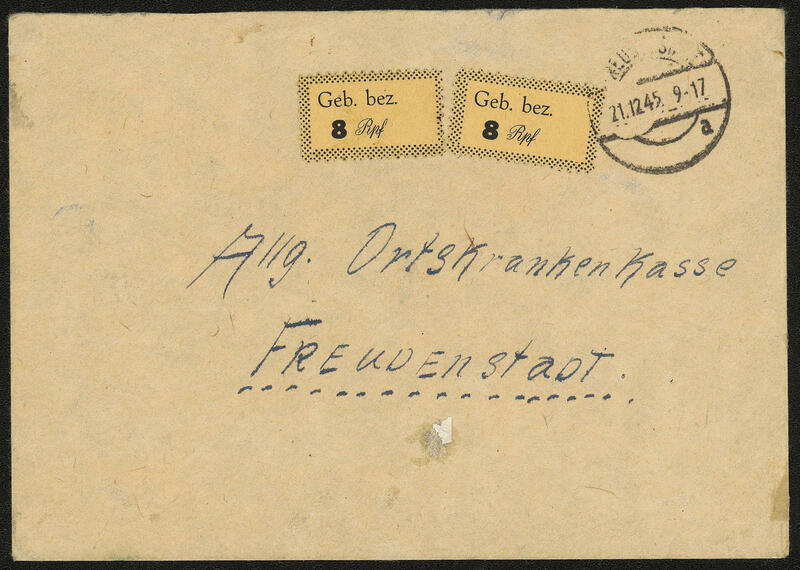 Black on golden, two examples as scarce commercially related multiple franking on local letter from \"FREUDENSTADT 21.12.45. \". In this kind are only a few documents have become known! 5918 ✉ 6 12 Pfg. 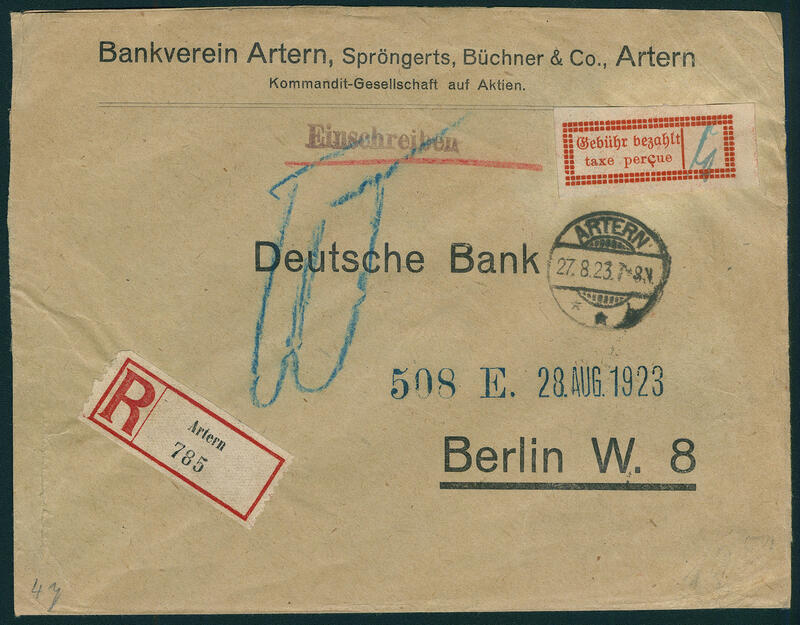 Black on rose, vertical pair from left margin of sheet, in perfect condition as very nice multiple franking on faultless commercially used cover the co-operative bank Baiersbronn with two ring cancel \"BAIERSBRONN 5.11.45. \". Very rare! Expertized Dr. Haferkamp. 5919 ✉ 6 12 Pfg. 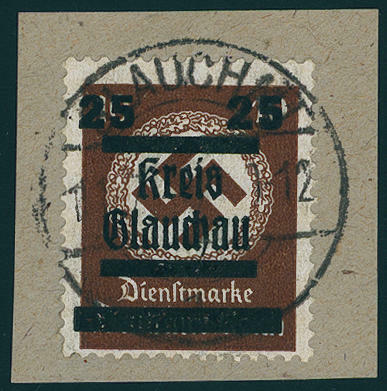 Black on rose, in perfect condition as correctly franked single franking on very nice commercial letter from \"FREUDENSTADT 7.11.45. \" to Schopfheim. 5934 Jan 13 1-60 Pfg. 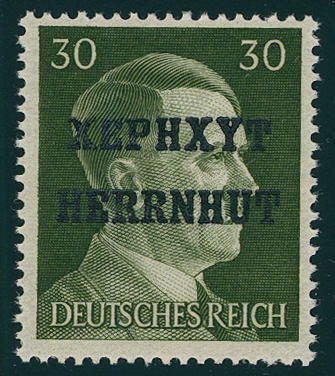 Hitler 1945, all 13 values, fresh colors and in perfect condition mint never hinged a very scarce, hardly once offered set! Expertized Sturm. 5935 DR787 10 Pfg. 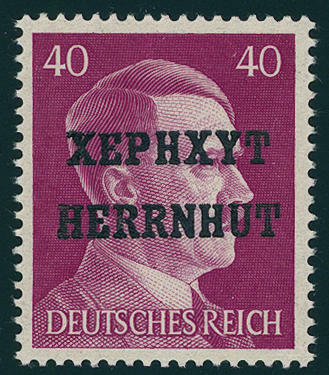 Hitler with overprint \"gentlemens hat\", fresh colors and very well perforated, in perfect condition mint never hinged this value was only on submission overprinted and is very rare! Expertized Sturm. 5936 DR790 16 Pfg. 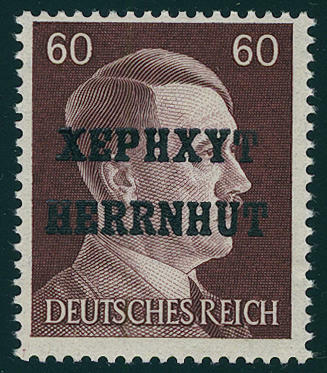 Hitler with overprint \"gentlemens hat\", fresh colors and very well perforated, in perfect condition mint never hinged this value was only on submission overprinted and is very rare! Expertized Sturm. 5920 ✉ 7 MEERANE Provisional arrangement 1945: 25 on 12 Pfg. 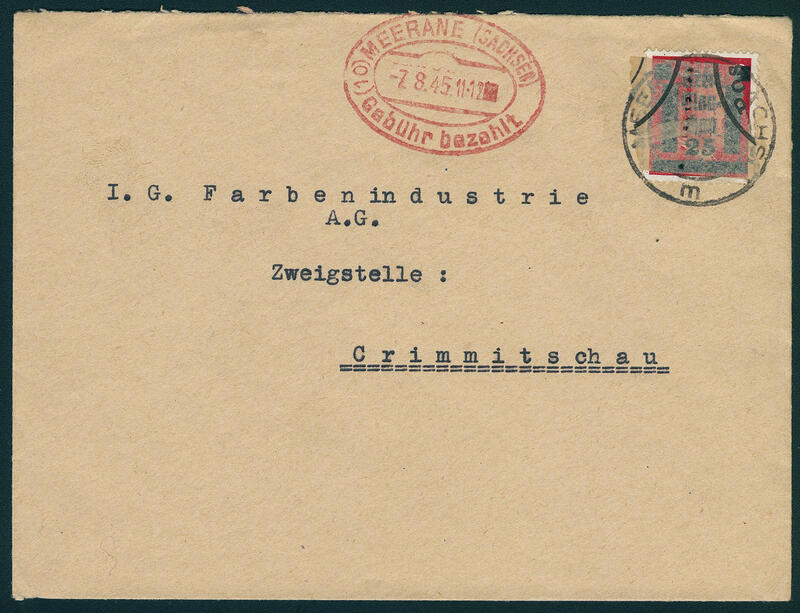 Red with postal service seal slip of paper as labels, the famous \"MEERANE Provisional arrangement\" on very nice, faultless commercially used business letter with two ring cancel \"MEERANE 7.8.45. 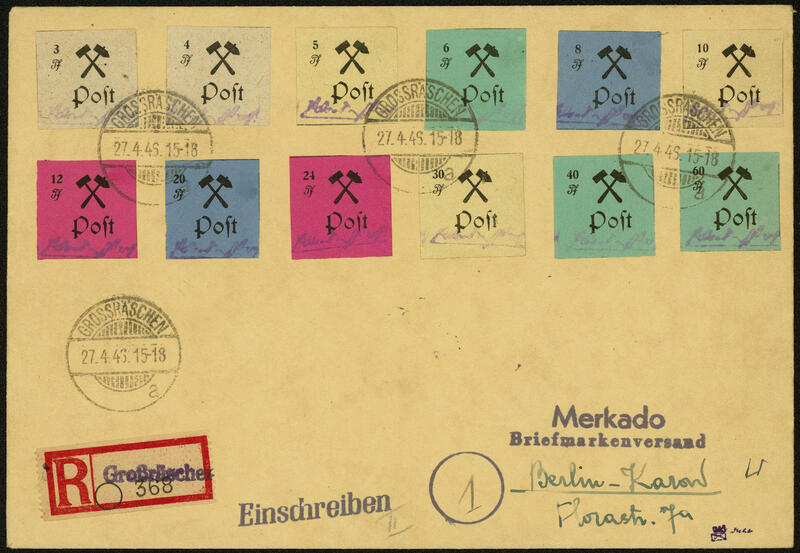 \" and additional red elliptic postmark \"MEERANE (things) taxe precu 7.8.45\" to Crimmitschau. 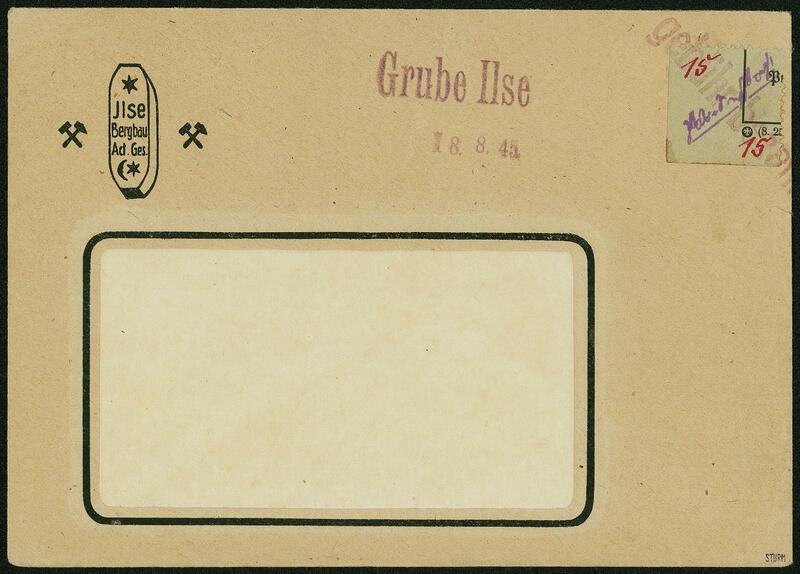 The cover is after the elevated so-called American postage tariff appropriate for franked. A dreamlike fine example the postwar Philately of prime rarity for the highest standards! Photo expertize \"perfectly quality\" Dr. Penning BPP. 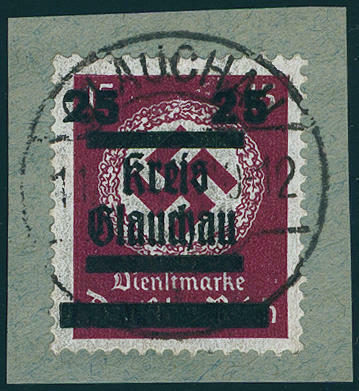 5921 ∆ 30/42 Authorities offical stamps 1945, all 13 values fresh colors and in perfect condition on beautiful outstandig quality pieces, very nice canceled \"GLAUCHAU\". A dream set of this rare issue for the highest standards. Issued only 200 sets! Photo expertize Zierer BPP. Michel 4400,- €. 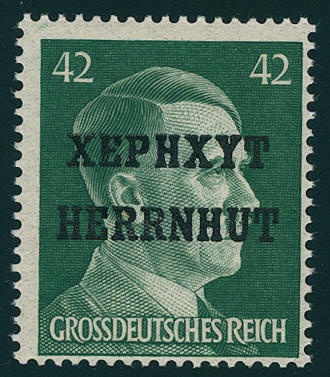 5922 30/42ex Authorities offical stamps 1945 except for Michel no. 35, 38 and 40 complete, in perfect condition mint never hinged, expertized Zierer BPP, photo expertize \"perfectly mint never hinged quality\" Dr. Penning BPP. Michel 740,- €. 5927 ✉ V11DZ 15 Pfg. Red on green, fee label 1945 with printers mark on cover with violet one-line cancel \"taxe precu\" and additional two-line cancel \"mine ILSE 18.8.45. \", in this kind a local issue rarity and possibly unique! Certificate storm. 5928 ✉ V22IU 6 Pfg., forerunner fee label unperforated with variety \"numeral of value black in lieu of red\" in perfect condition on very nice commercially related postcard with violet provisional cancel \"Large ashes 15. 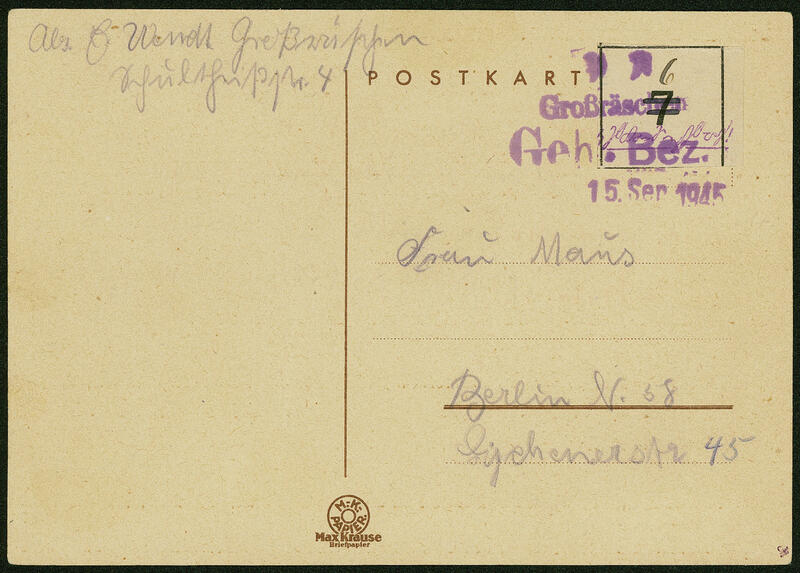 September 1945\" to Berlin. Very rare! Expertized Zierer BPP. 5929 ✉ \"post office Large ashes taxe precu 21. 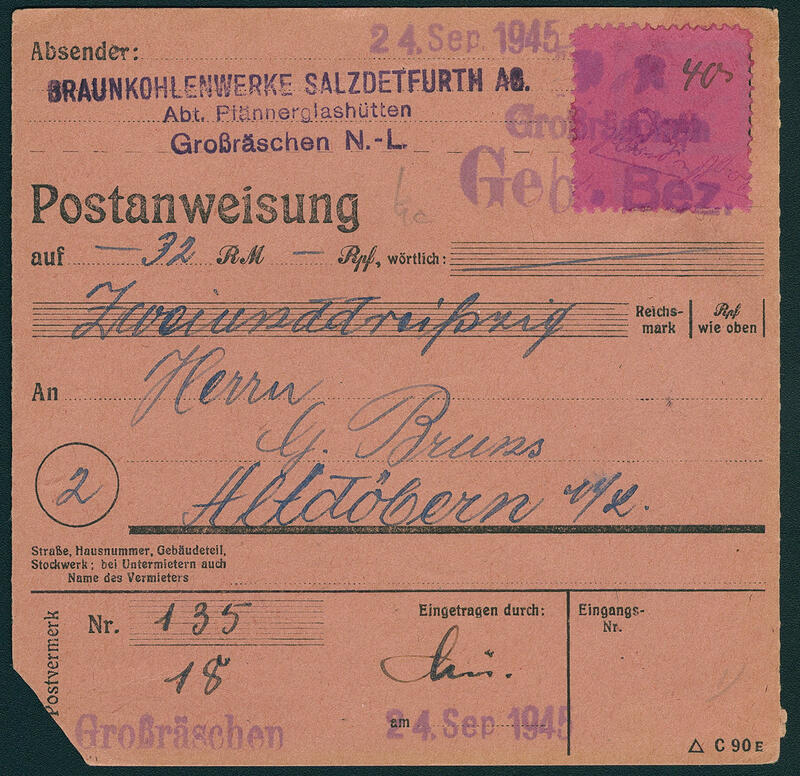 Oct 1946\", three line with additional dated postmark clear on post paid postcard of the post office Grossräschen to Berlin-Charlottenburg regarding one deliver from stamps. Very rare! 5930 ✉ 11a 40 Pfg. Rose lilac, fresh colors and in perfect condition as very nice commercially use in the issue month on money order with provisional cancel \"Large ashes GEB. BEZ. \" with additional dated postmark \"24. September 1945\" over 32 Mk. 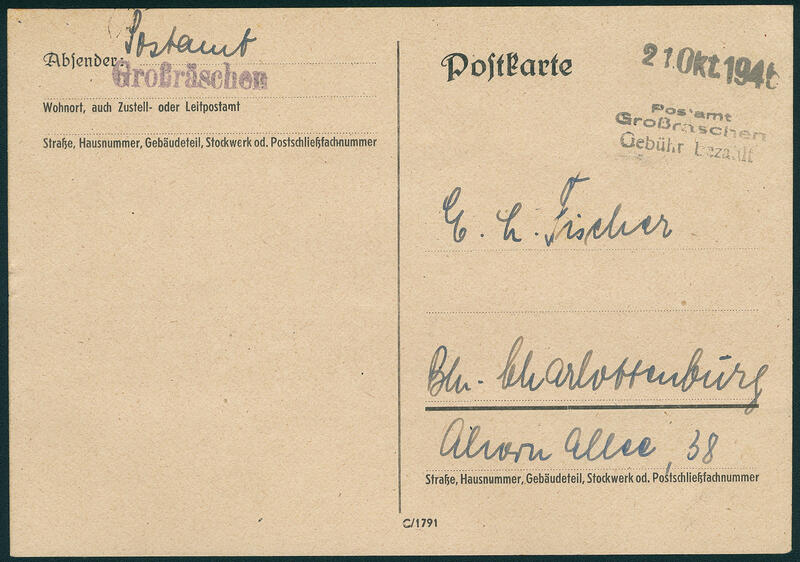 (old form in Reichmark) to Altdöbern. An especially nice and rare document! 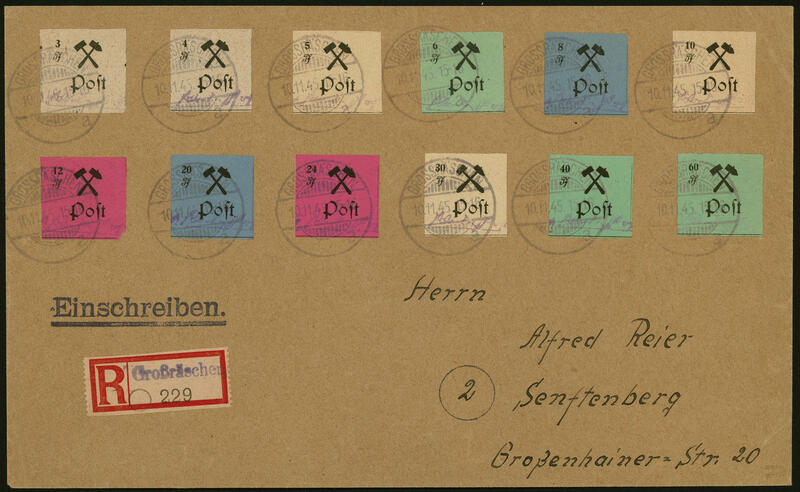 5931 ✉ 13/24B Fee stamps 1945, unperforated, herewith 30 Pfg. 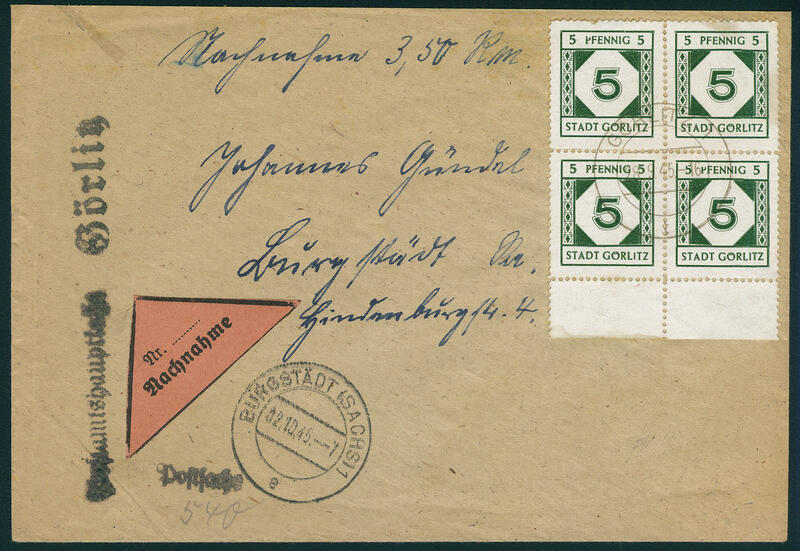 In rare type III on registered cover from \"GROSSRÄSCHEN 10.11.45\" to Senftenberg with arrival postmark on the back. Michel for used 1075,- €. 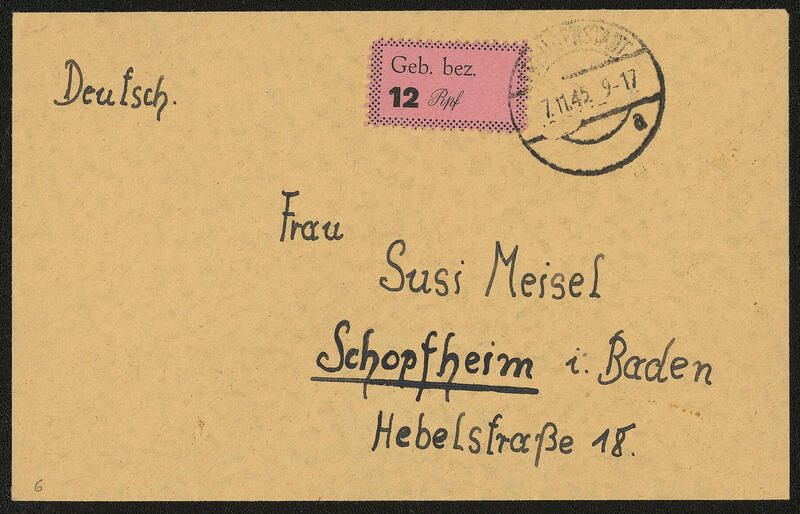 5932 ✉ 13/24B Fee stamps 1945, the complete unperforated set, wonderful fresh colors and in perfect condition on registered cover from \"GROSSRÄSCHEN 27.4.46\" to Berlin-Karow with arrival postmark. Already lots used extraordinarily rare, on cover a rarity! 5926 ✉ P898 6 Pfg. Violet on chamois cardboard paper, postal stationery fresh colors and in perfect condition unused. 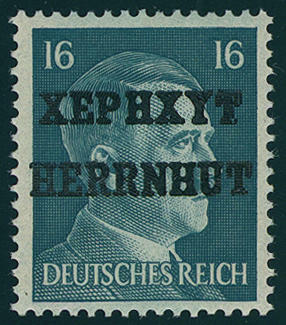 An extremely scarce issue, the only in few copies have become known is. Photo expertize \"genuine and immaculate\" Ströh BPP. 5923 ✉ 2 6 Pfg. 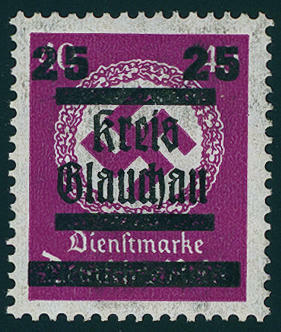 Dark brown violet, in perfect condition on very nice commercially related postcard with detailed text from \"GÖRLITZ 7.7.45. 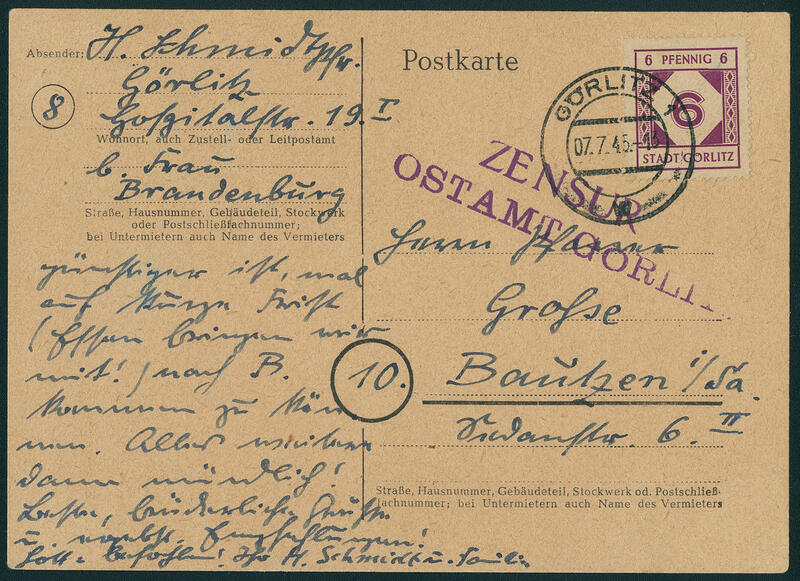 \" with very scarce censorship stamp \"censorship OSTAMT GÖRLITZ\" to Bautzen. Near the post office was the P from the stamp broken out. 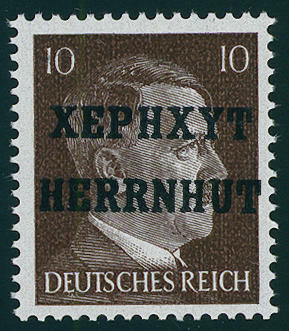 This defects stamp was only short time used before the P re-employed was. 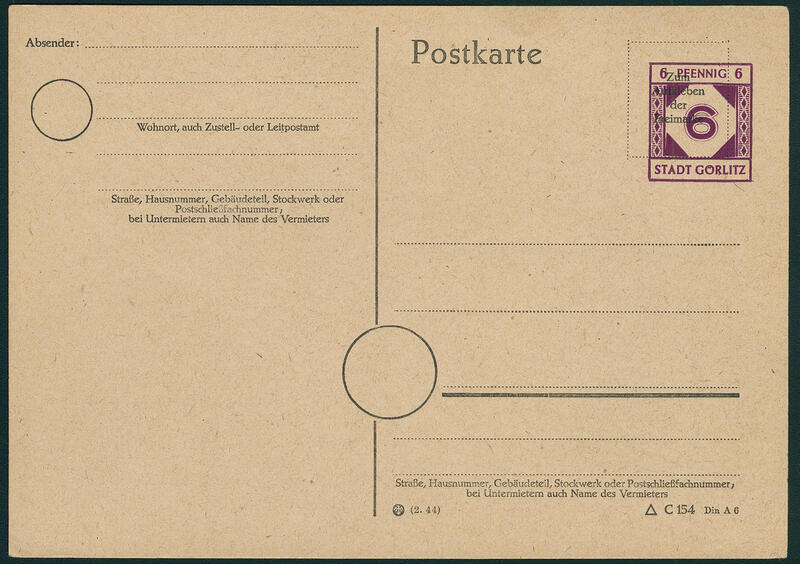 Postcards of this kind to class among the Görlitz rarities. Photo expertize \"genuine and immaculate\" Ströh BPP. 5924 ✉ 3 8 Pfg. 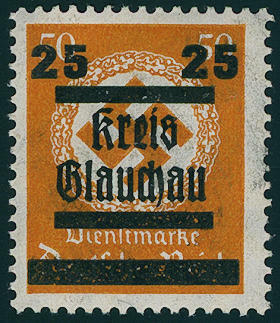 Red orange, in perfect condition as correctly franked single franking on locate fold letter from \"GÖRLITZ 14.7.45. 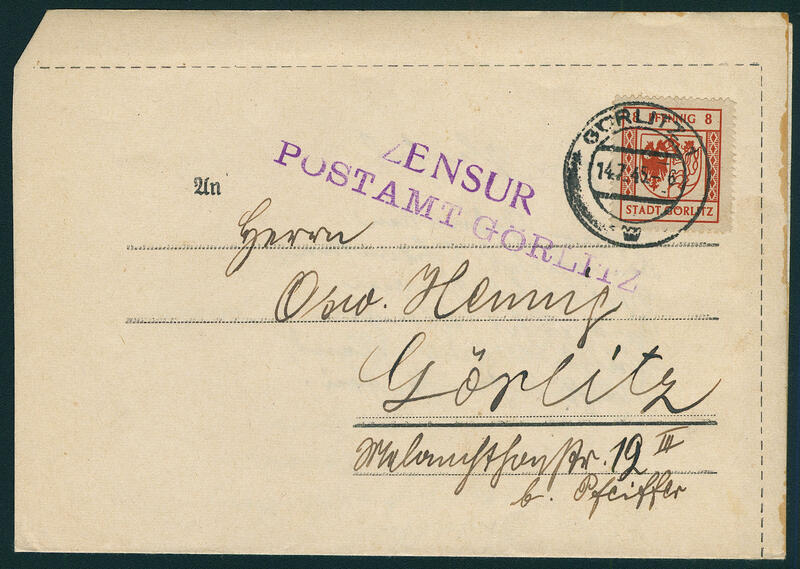 \" with violet two line cancel \"censorship post office GÖRLITZ\", commercially used. Covers of this kind are rare! Photo expertize \"genuine and immaculate\" Ströh BPP. 5925 ✉ 9x 5 Pfg. 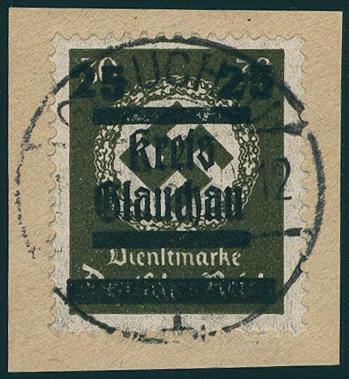 Blackish olive green, block of four from lower margin, in perfect condition as correctly franked multiple franking on C.o.d.-letter as postal matter from \"GÖRLITZ 28.9.45. 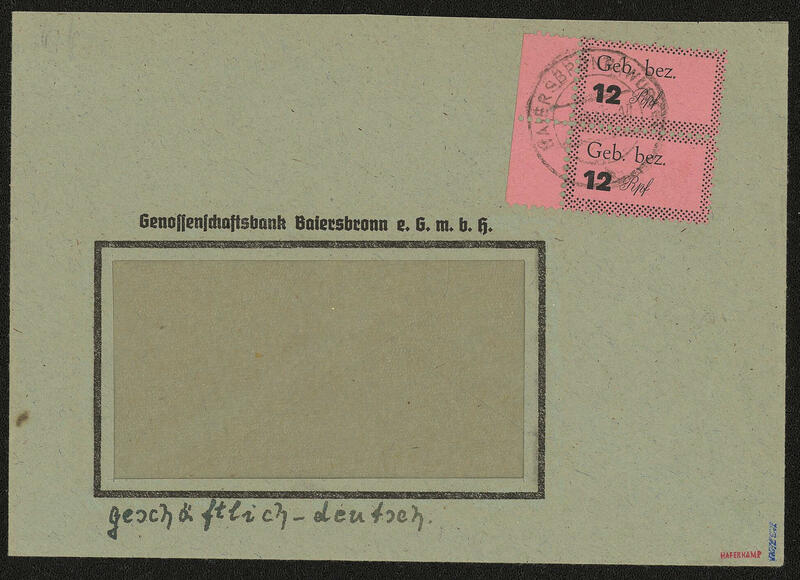 \" to Burgstädt with arrival postmark. Very scarce utilization! Photo expertize \"genuine and immaculate\" Ströh BPP. 5933 ✉ 2IIa Fee label 1923 in brownish red, the scarce type IIa, with wide margins on registered cover from \"ARTERN 27.8.23. \" to Berlin. An extraordinary use of the rare type within a small city!